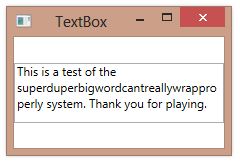 Even if a TextBox has its TextWrapping property set to NoWrap, text added to the TextBox will automatically wrap if that text includes embedded carriage returns. 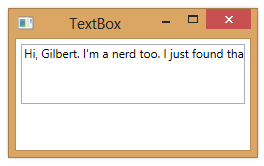 In the example below, we define a multi-line string (using verbatim string notation) and then bind the Text property of a TextBox to the string. 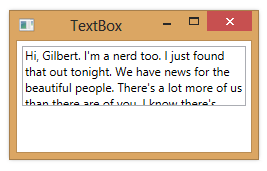 The text then automatically wraps within the TextBox. 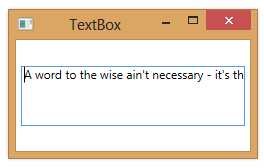 Even when text in a TextBox does not wrap to fill multiple lines, the text is still contained in the TextBox and you can scroll through it or select it. 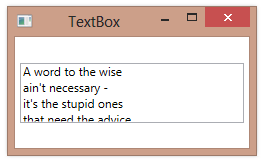 When a Button control automatically sizes to fit its content, it will grow to fit the text in the Content property. However, the text will always remain on a single line. <Button Content="Click me if you want to see something cool. In fact, click as many times as you like." 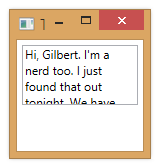 If you constrain the button’s Width, however, the text will be clipped. 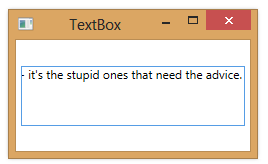 To get the text on a face of a Button to wrap, you can use a TextBlock as the button’s Content, rather than a simple text string. 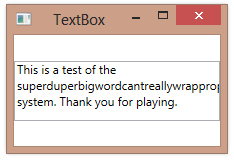 You also set the TextWrapping property on the TextBlock. <TextBlock Text="Click me if you want to see something cool. 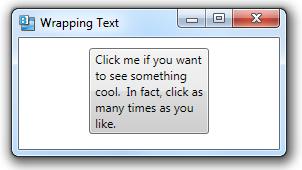 In fact, click as many times as you like."